1 - In the photo you see at the right, two pigtail cables provide an interface for circular connectors. 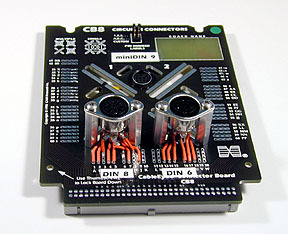 Separate circular and DB9 male connectors are mounted on standoffs. The pigtails flow under the board and connect to the test point pads underneath. The flexibility of pigtails make them a good choice when the cable under test is large, heavy, or unwieldy. 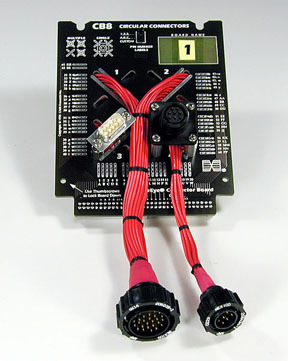 You may purchase the CB8 board and ask an in-house technician to mount your custom connectors, or ask us for a quotation to configure and test a CB8 for you. 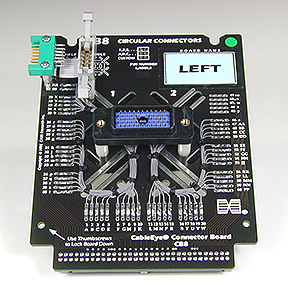 2 - Here, you see how a circular connector is supported by standoffs and wired to the underside of the board. 3 - The DB15 connector mounted to this CB8 has a CAMI Connector Protector attached (the device with the blue plastic insulator). A Connector Protector looks like a mini gender changer but does not change the gender. It absorbs the wear of repeated cable insertion and can be replaced in seconds when the pins become intermittent or break. 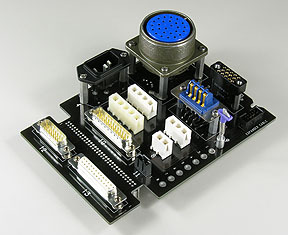 4 - In this photo, you see two DIN8 connectors are mounted to the surface and a miniDIN9 connector recessed into the board and wired from below. 5 - The blue-green wires you see here are actually miniature coaxial cables that mount to a mixed pin Dshell connector at the end of the pigtail. 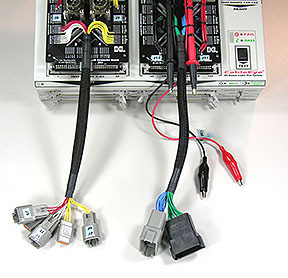 Note the individual flying leads available for power and ground connections. 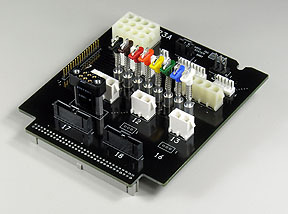 6 - These large, 56-pin Elco connectors easily mount to our CB8 board, which can support connectors with up to 64 pins. 24-gauge red wire link each pin to one of the terminal pads on the board. 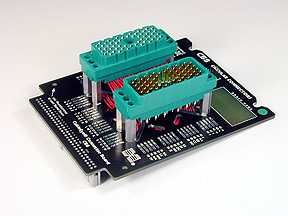 For larger pin counts, our CB30 board (Item 760, similar in design to the CB8) can support up to 128 pins. 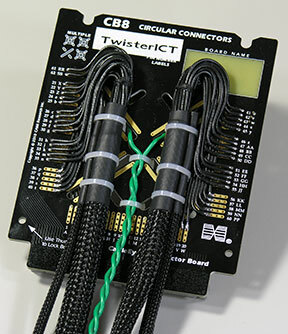 7 - We designed this special arrangement to handle a wiring harness that included weatherproof connectors, battery terminals, and single-conductor rubber-insulated high voltage leads. 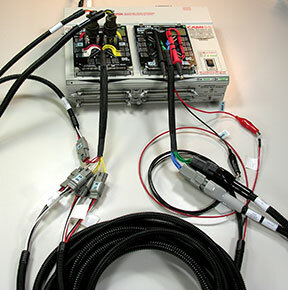 8 - The black connector and its mate are one-of-a-kind connectors designed for a specific automotive test application. An FR4 fiberglass sheet may be placed over exposed wiring to protect it from damage and insulate it from the surroundings for high voltage testing. 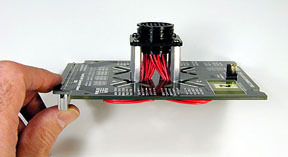 9 - These 8W8 connectors contain eight coaxial conductors mounted in a DB37-size shell, an unusual arrangement requiring a pair of these custom-built interface boards. 10 - We will design custom plug-in boards for CableEye to meet your exact test requirements. If you prefer, we can also provide you with the routing and layout information to create the design in-house. In these photos, you see four of a series of ten custom CB boards we designed for one of our customers. Contact us for a quotation on any custome interface development that you need. 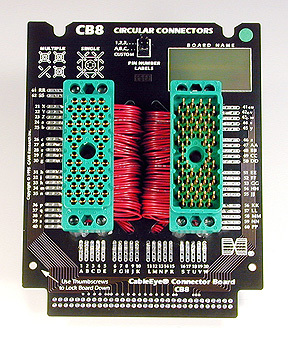 11 - This CB8 board has multiple adapter cables mounted to take advantage of as many test points as possible on this single board. 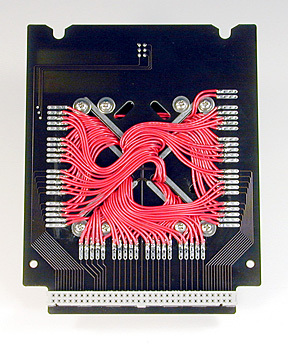 The green wires lead to lug terminals whereas the sheathed wires go to multi-pin mating connectors. Labels made by a labelmaker may be applied to the board as shown here, or lables handwritten in pencil or pen written on the bare green fiberglass area shown in the upper right. 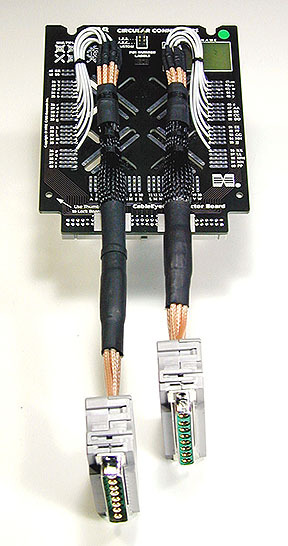 12 - The adapter cable on this board interfaces a large mixed-signal rectangular connector seen below. 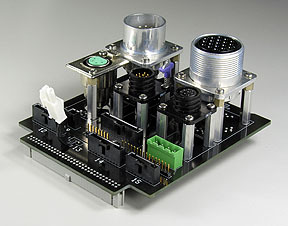 In addition to standard signal pins, the connector also has coax and power pins. Notice the blue, white, and black wires in the upper right corner of the board. 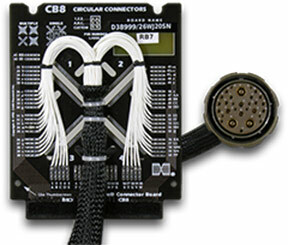 These wires break out the coaxial cables into individual conductors that can be soldered to terminal pads on the CB8. Keep in mind that we need not be concerned with keeping the round shape of coaxial pins or the heavy gauge wire of power pins because the CableEye tester applies no more than 3 milliamps at 10v to check continuity and resistance. Dynamic properties (RF impedance, for example) are not tested with CableEye. If you are using our HVX tester to make a 4-wire Kelvin resistance measurement (sensitive to 1 milliohm), an AmpModu interface rather than this CB8 interface would provide lower resistance for the 1-amp test current used with 4-wire applications. 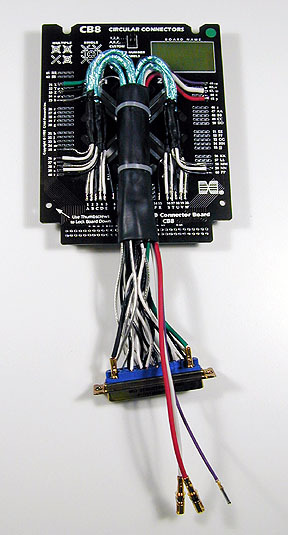 13 - This special interface board was build for an automobile manufacturer to test OBD (on-board diagonstic) cables that link a car's system computer to a hand-held computer. Only a single board was needed since the cable has only 16 conductors. Cables like this have a male connector on one side and a female on the other, so we could easily make this interface by taking a known-good OBD cable, cutting it in half, and wiring each half to the CB8 as shown here. We attached a felt strip to the front edge of the board to prevent chafing as the adapter cables move around. 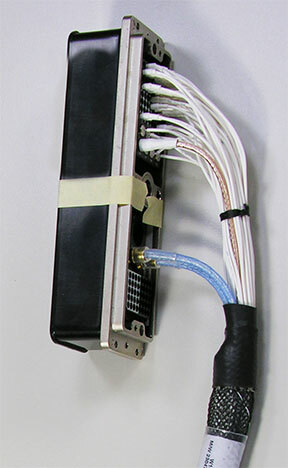 14 - This unusual application involved a panel-mount mating connector for one side of the unit under test, and a cable-mounted mating connector for the other. 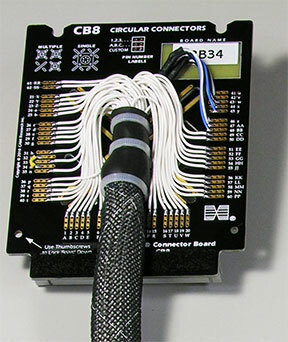 We mounted a fiberglass plate on standoffs over a CB8 board so the panel-mount connector could be securely attached. Also, with all of the wiring under the fiberglass plate, it is protected from possible flexing or abuse. 15 - We had just enough pads available on this CB8 board to mount the 62-pin adapter cable you see here. Mating connectors may come either as cable-mounted connectors as you see here, or bulkhead connectors which would mount directly to the CB8. If a mating connector is avialable either way, then the method used depends on the customer's test process. 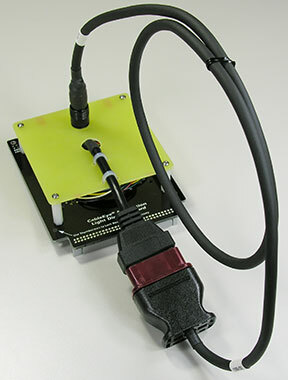 While a bulkhead connector mounted directly to the board produces a more compact interface, it may not be appropriate if the test cable consists of heavy-guage wire or is bulky. 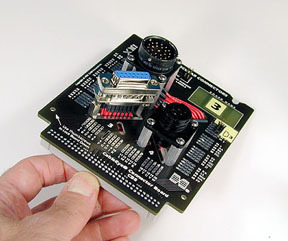 Heavy or bulky test cables can apply unreasonable force to the board or tester when attached, or even pull the tester off the workbench.